Hello all! My name is Samantha Cardellicchio and I will be taking over the PCOM School Psychology blog. Currently, I am first year student in the Educational Specialist (Ed.S.) program. We recently just started our last semester of the year before we break for the summer! I also completed the MS School Psychology degree at PCOM last summer. We had a few classes over the summer so we are all looking forward to this break. When I am not doing school-psychology related things, I work as a TSS (Therapeutic Staff Support) and PCA (Personal Care Assistant) in Chester County providing one-to-one emotional support and behavioral interventions to children in need of wraparound services. Over the past one and a half years, many of my clients have been diagnosed on the autism spectrum so I spend a lot of time modeling and reinforcing appropriate expression of emotions and pro-social behaviors. But what brought me to school psychology at PCOM? Well, I can tell you a massive pro-con list was involved. I received my BS in Psychology at James Madison University in Virginia and during my junior year, I took an introduction to school psychology course there. The more we learned about the career of the school psychologist, the more I realized that my strengths and interests as a person really matched the career. Time management, organization, interpersonal skills, analytical thinking, an inquisitive nature, and a desire to help all children succeed are attributes that I had prior to my education at PCOM, but I work on and strengthen these skills and interests every week that I am in class. One of my professors from fall semester compared the school psychologist’s job to that of a “brain detective”. And really, we are learning to be “brain detectives” at PCOM. Our professors are teaching us to attain all sorts of information (behavioral observations, school records, parent/student/teacher interviews, cognitive and academic assessments) in order to figure out how best to help a child that is referred to us to learn. School psychologists are trained to put all of the pieces together like a puzzle, and in the end, they form a complete learning profile of the child. This information assists the school psychologist in working with teachers, school staff, administrators, and parents to help the child succeed to the best of his or her ability in the school environment. I am looking forward to sharing my experience of completing my education here at PCOM as well as enlightening anyone who reads this blog about the wonderful career that is school psychology! 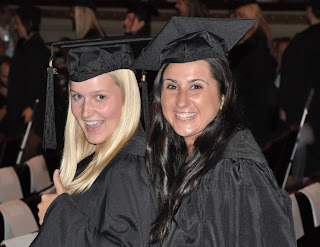 MS School Psychology graduation last summer at PCOM (me on left and fellow cohort member, Meg)! It is cool to see how you came to the conclusion that school psychology was the career for you. I am a school psychologist in my second year of practice from Ohio. I also have a website (schoolpsychologyprograms.info) that provides a blog and information on school psychology. I am looking to do Skype or text interviews with some folks in the field. Would you be interested? If so, please email me at admin@schoolpsychologyprograms.info. The resulting interview could be embedded on this blog from Youtube! P.S.-This is not spam, I am a real person.